Looks great! Quality feels good too! 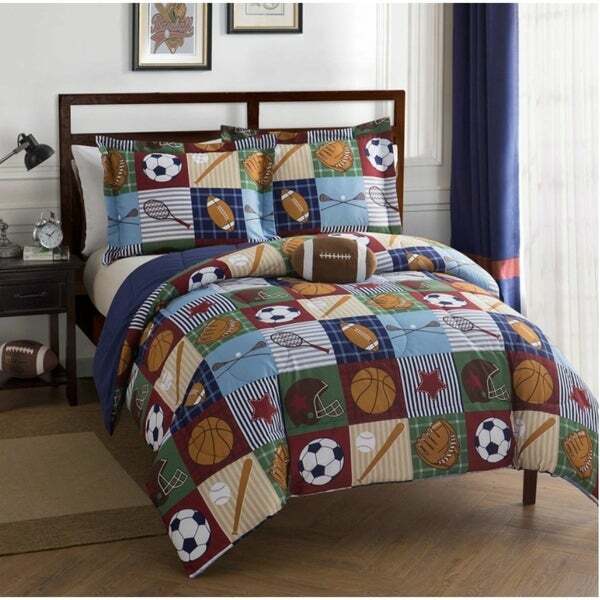 Any sports fan will appreciate this patchwork comforter set with football shaped plush fleece pillow. Navy, burgundy, tan and greens coordinate with any bedroom and feature football, soccer, baseball, lacrosse motifs on plaid and stripes. Double brushed fabric is extremely soft, durable, and easy care. This comforter is so soft and made of very good quality. I got this on sale and the price was great. I also got free shipping which was a plus. This was a gift to my grandson and he loves it. This goes great in his sport themed room. He is 5 and this comforter was more appropriate for his age. His other comforter was worn and more toddler age. The colors are great and go with everything. The only complaint I could find was the comforter was a little small for full size bed... I wish it could have been a little bigger but it is a comforter not a quilt so I could not deduct off my 5 star rating for that. I wish I ordered a queen but not sure it comes in a queen. I would highly recommend this to anyone considering this purchase. I would buy it again . Great comforter for the price. The fabric is nice, softer than I thought it might be, and colors are exactly as pictured. My son really liked the football pillow that was included. GREAT COMFORTER SET. FEELS VERY GOOD AND MADE OF GOOD QUALITY. BOUGHT A TWIN AND A FULL FOR MY BOYS. I brought this product for my son. I was skeptical if the colors would be as attractive as the picture, however it met the test. I wish it had curtains to match for a boys room to make things simple. It would be nice to get a full comforter bed-in-a-bag set for children that included everything for a room. Yes. I did review the comforter set bed-in-a-bag, however, I did not see this particular set as a opition. Anyway, my son like it's, that's all that matters. I guess I'll search for curtains and sheets to match else where. comforter arrived ahead of time. Good quality ! Washed and dried and still looks great ! Very cute for my 2 year old son !! He loves it ! "Is this big and puffy. I am looking more for one that is not so huge to wash easily. Thanking you in advance." This set is not big, but can be machine washed.